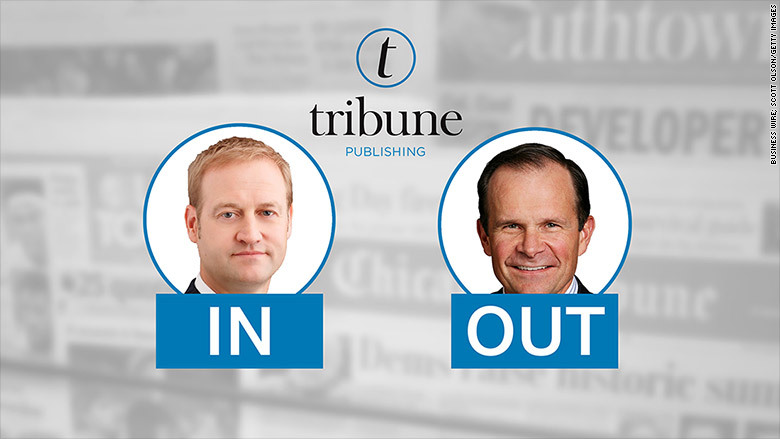 Justin Dearborn is replacing Jack Griffin as CEO of Tribune Publishing. The CEO of Tribune Publishing has been unexpectedly and suddenly ousted. And now yet another management team will try to figure out how to profit from Tribune's storied but troubled newspapers. Jack Griffin, the CEO for the past two years, is gone, effective immediately, according to an announcement from the company on Tuesday morning. Justin Dearborn, a health care technology executive, is taking over. "Although this is a different medium than my last technology company, it has the same challenge on how to create the highest value for our content," he said in a statement. Dearborn is an acolyte of Michael Ferro, a venture capitalist and Chicago entrepreneur. Here's where the corporate intrigue starts: Ferro bought a $44.4 million stake in Tribune earlier this month, instantly making him the single biggest shareholder in the company. At the time, Griffin said the investment would support his strategic plan for the company. But as the newly-named chairman of Tribune's board, Ferro "ousted" Griffin, according to the publishing industry analyst Ken Doctor, who first reported the change. "Griffin had not expected the man he had brought in as essentially a partner to push him out," Doctor said. Related: Will Marissa Mayer be Yahoo's last CEO? Griffin, a polarizing name in media circles, was hired by Tribune in 2014 after being fired from Time Inc. after only six months. His contract with Tribune was set to expire in about a year. On Tuesday morning, a spokesman for Griffin disputed the suggestion that he was fired by Tribune, saying Griffin brought in Ferro as an investor and then the two men jointly decided that the time was right for Griffin to leave. While Ferro wanted to consolidate the company in Chicago, Griffin was reluctant to move from New York, the spokesman added. On Tuesday morning, Ferro said the Tribune board thanked Griffin "for his significant contributions." Attention now turns to what Ferro and Dearborn will do with Tribune. The company spent four years in bankruptcy proceedings and later broke itself into two pieces, with its more profitable television stations becoming Tribune Media. Tribune Publishing owns the Los Angeles Times, Chicago Tribune, Baltimore Sun and a portfolio of other newspapers. The papers have seen better days: changing consumer behaviors and a succession of cost-cutting moves have caused the newsrooms to shrink dramatically in recent years. Reacting to the latest shakeup, LAObserved blogger Kevin Roderick wrote, "The LA Times has always deserved better than the bozos in Chicago. The names just change." The leadership change could create a new opportunity for a sale of the Times. A group of California investors have been interested in acquiring the paper, and restoring local ownership, but Griffin was said to be staunchly opposed to such a move because it would amount to a breakup of Tribune. Meanwhile, in Tribune's newsrooms on Tuesday morning, there was considerable curiosity about Dearborn's past. Working with Ferro, he became the CEO of Merge, a medical imaging company, in 2013. Last summer IBM acquired Merge for $1 billion -- resulting in a huge payday for both men, especially Ferro. In his statement on Tuesday, Dearborn said, "I believe Tribune Publishing has a significant opportunity to leverage technology to increase the value of its content and distribution channels."